The amendments to the Personal Income Tax Act (PIT Act) were promulgated in State Gazette 94/30.11.2012. The amendments shall enter into force as of 1 January 2013. Some of the most important changes to the PIT Act are summarized below. As of 1 January 2012 a final tax at the rate of 10% shall be levied on the gross amount of income received as interest from bank deposit accounts. The new final tax could be briefly represented as follows. 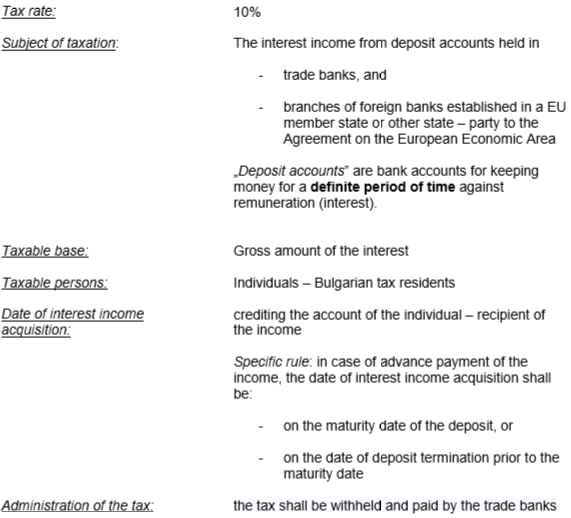 Following the definition of “deposit account”, provided for under the Act, it could be warily concluded that the only criterion that divides the interest incomes to taxable and non-taxable is the condition whether the bank account is open as such for a limited period of time (paragraph 1, point 58 of the Supplementary provisions of the Act). Considering the variety of “products” offered by the banks it is a matter of time to understand how the tax administration shall treat the incomes, accounted for by the trade banks on accounts which do not fall within the legal definition of “deposit account”. There might be even more difficulties when justifying the type of the bank account in case of a Bulgarian tax resident who keeps a bank account at foreign bank operating abroad. Taxation of interest income accrued during preceding years which maturity date shall occur in 2013: It is also worth mentioning that the adoption of the new rules for taxation of interest from deposit accounts practically might result in taxation of interests accounted for limited term deposit agreements, concluded prior to 1 January 2013. The persons, party to agreements with the trade banks, concluded for instance in 2011, now would face a situation where if the interest income by the end of 2012 was deemed non- taxable, while with the new rues that income shall be subject to 10% final tax only under the condition that the entire interest amount has a maturity date after 1 January 2013. It is possible that the provisions concerning the new final tax on interest be appealed before the Bulgarian Constitutional Court.